It’s old news to some and an announcement for others that when I graduate in May, I have the exciting opportunity to move to Oregon for the summer. This summer I’ll be working at Camp Magruder as the Program Director under my good friend, Troy Taylor. Because of that, I’ve been thinking about Oregon music these past few weeks, and I decided that this week I’d dedicate my playlist to Oregon, to my summer, and the transition my life is going through as I prepare to graduate and start the next phase of my life. 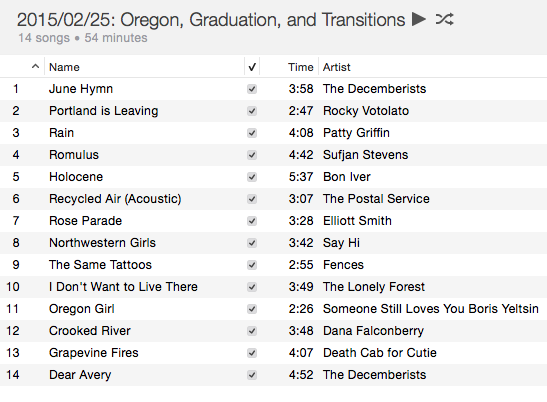 I opened this week’s playlist with The Decemberists’ “June Hymn” for my summer in Oregon. I met Troy many a summer ago when I was very young and Troy was still the Program Director at my childhood church camp, Lakeshore. Over the years, through growing up as both a camper and a counselor at that camp, I feel as if Troy has grown to be not just a mentor but, thankfully enough, to be a very good friend of mine. So in December when Troy announced that he’d be moving across the country and taking a new job in Oregon, I was (albeit selfishly) a little sad. For the past year or two, Troy has lived just under an hour from my Tennessee home, and it’s made visiting Troy and Allyson convenient and one of the joys of coming home from school. 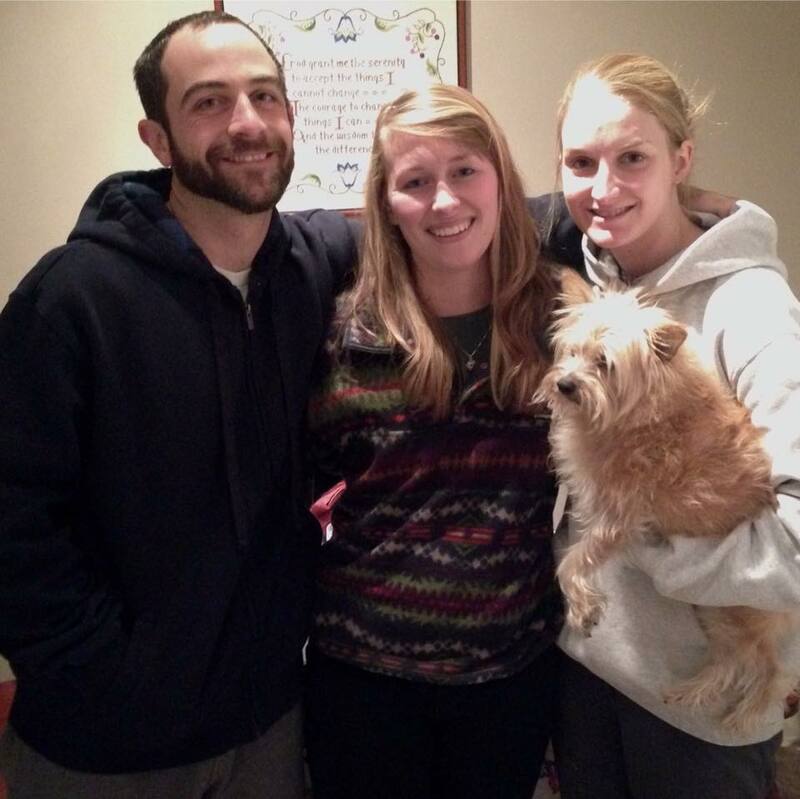 Here’s a picture of Troy, Allyson, and me the last time I visited them in Murray, Kentucky before they moved. I’m excited to spend my next summer alongside Troy. I’m excited to live in Oregon. I’m excited for the change. This sort of spark in me is a side of myself I’ve grown to be both very familiar with and slightly fearful of. It’s a thirst for adventure, for progress. It’s a drive to see and do and travel. But, in the past, it’s also been this very impulse that disconnected me from important and essential people in my life. It’s dangerous for me because I recognize in myself a conflict of interests that I find hard to balance—one, the hope that I can be relational and make deep connections with those around me, and two, the urge to go and to see and to experience everything that I can. It’s something my friend, Nate, and I talk about a lot. Nate says a lot of things that I recognize in myself. Sometimes they strike so close to home that I don’t know how to respond, or I hear myself responding from the side of me that aims to pull in the reigns, to be the voice of reason for the always going, always moving, always leaving side of me. But things Nate says set off alarms of truth in my own experience of life; they’re things I want to remind myself, things I want to keep in my back pocket for this next phase of my life after college. Don’t settle, I want to tell myself. Don’t miss out. I find myself much more like the Hendrix College freshman Hope, and I worry about making the same mistakes now that I made then. Yet that very self-awareness reminds me that I can learn from those mistakes, too. I’m excited, too, to work at a church camp again. I’ve changed a lot since I worked at my last church camp, especially one that follows the traditional summer camp format. I’m curious how these changes will manifest themselves this time around, but I’m ready to reconcile with this old side of myself—a side of myself I once loved and valued, but a side of myself I also have grown weary of, a side of myself I’m not sure how to handle as my own beliefs have changed. But I love to be surrounded by people that are searching for a spiritual connection, searching for meaning. It’s why I love Troy. It’s why I love Nate. It’s why I love summer camps. And I love that pursuit in my own life, but I’ve been disconnected from it in a tangible, routinely guided sort of way for a long time now. I’m curious what new I can bring to that table now, and I’m ready in a different way that I once was—I think—to handle some of the challenges. But I’m also different, and I know some of the everyday challenges will often be hard and uncomfortable for me to face. Then there’s graduation. It hit me just this weekend what it meant to be graduating. I’ve been thinking of it as just graduation for some time: graduating, being done with schoolwork, done with campus jobs, done with KHDX. But I’m realizing that graduating also means leaving a significant portion of a significant amount of time that I will get to spend with very significant people in my life. I love life here at Hendrix. I’m surrounded by wonderful friends. I have some friends that I, unfortunately, just made this year; I have friends that have literally been there since day one; I have friends from every day in-between that I couldn’t be more thankful they found their ways into my life. I think I probably subconsciously blocked the reality that graduating meant an end to a very significant time in my life to spend with those people, too. 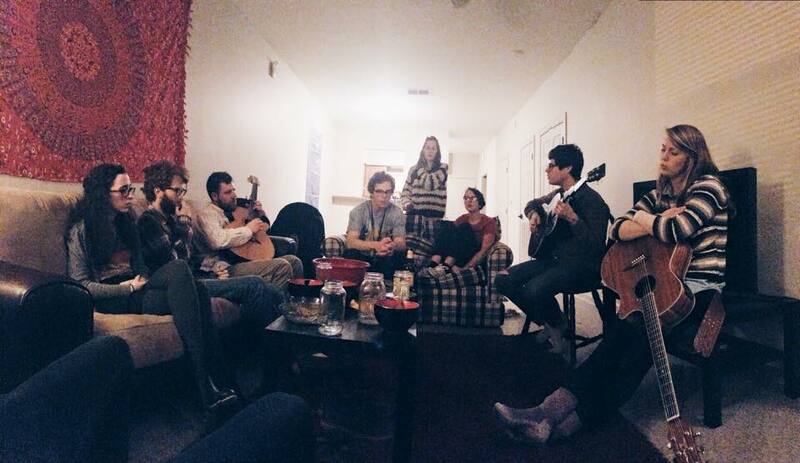 “Romulus,” by Sufjan and “Oregon Girl” by SSLYBY were actually the songs that inspired this playlist for this week. Not only do they both mention Oregon, but they also are songs that remind me of my friends here at Hendrix because I can imagine my fiends and me playing either of them. Here’s a picture about those friends. But I go back to Nate. Nate and I also are similar in that we both have had incredibly lucky and happy college years filled with grand opportunities, successes, and friendships. I’ve thrived here at Hendrix. I have more campus jobs than it’s easy to explain. I love my classes; I have the best academic advisor in the world. I’ve had the great honor of making KHDX my home and my passion. It’s busy and a frenzy, but I thrive in it. But Nate talks a lot lately of wanting more out life than what’s easy and what’s comfortable. Something that’s hard to get out of the bed in the morning for, something that makes him stop and rethink everything he thought he knew. I think the next few years will be that for me. I expect a lot of confusion and messiness as I sort out what the next phase of my life even is. But it’s that very want—the want for a different sort of challenge, a different sort of fulfillment—that I think can help me reconcile the two sides in myself, the side to leave and the side to stay. Next year, I’m excited that I’ll be aiming to satisfy a part of my life that has been severely lacking—my own long distance relationship with Garrett. I used to get scared that a relationship was settling. That it was a box that I could become trapped inside. These days, I see it more as a new adventure, a different kind that asks me to let go of the frenzy I’m so used to taming to focus on something else just as meaningful. I want to learn to better find the meaningful in the mundane, something that has been hard for me in the rush of my college years. I look forward to that. I think my impulse to move and to go is an impulse fueled by a search for meaning. So lately, I’ve been thinking that, as long as I am looking, I can find meaning in the going and in the staying. My goal in the end is just to always be searching. As for graduating and for leaving behind those that I love, I have no doubt that it will be hard. I’ll probably cry, and I hate to cry. But there was something an old camp mentor told me before he probably even knew who I was. I was probably only twelve or thirteen at the time, and I was complaining about not being old enough to be a counselor. Troy, the king of finding meaning in his everyday life, looked at me, laughed, and said, “You know, everything comes with a time, Hope.” And I took that to heart. I couldn’t stay here one more year any more than it would be right for me to wish to go back to freshman year. These days it feels right that in May, I’ll graduate. In May, I’ll have a lot of goodbyes to say. In May, I’ll start the next phase of my life. In May, I’ll let go of what’s good and what’s comfortable for a new adventure. In May, I’ll move to Oregon. Here’s to Oregon, and all the change and transition it symbolizes for me these days. And will bend your limbs. You’re still far away the boy you’ve ever been.